Like seemingly everyone else, I’ve embraced the leopard-print trend with open arms. When the print started making a major comeback last fall, I found myself snapping up pieces right and left! One of the things that surprised me the most about my animal-print obsessions was how versatile they could be. I quickly realized the print can go with all colors and occasions, when styled appropriately. I’m all about maximizing my closet, so I love anything that can be worn a million different ways, yet still look fresh and on point. I’m also loving how designers are playing with the print and going far beyond the traditional leopard look. I definitely gravitate more towards what I call the “animal print” pieces, like this shirt which I’ve worn a ton, and the skirt you see me wearing here. I decided to style this skirt two completely different ways, both with items I already had in my closet, to demonstrate how easy it is to take this print through every season. The first outfit I put together is more of a winter look. I paired the skirt with tall boots, a turtleneck, and a faux fur scarf, which I thought would be perfect for any occasion this time of year. I opted for all black because it makes the print pop, while also being seasonally appropriate. Scroll down for outfit links and the second outfit! For the next outfit, I decided to go in the complete opposite direction. 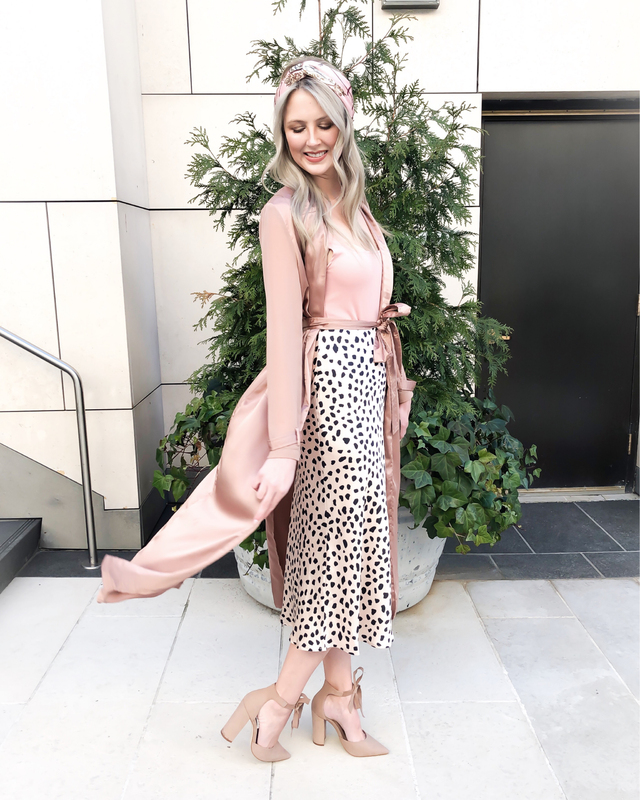 I lightened up the color scheme, which shows the versatility of the print, and paired it with a pink bodysuit and lightweight satin blush duster. This look is perfect for spring and could easily transition to even warmer weather by nixing the top layer. This skirt is already one of my favorite purchases and I’m excited to share even more ways to style it in the coming months! Scroll down for outfit links! How do you guys feel about the leopard trend? Let me know in the comments!